Turkey became a bit lazy after a hattrick of totally inventive entries to the Eurovision Song Contest. 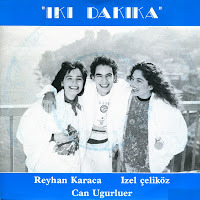 After 'Sufi' by MFO (1988), 'Bana bana' by Pan (1989) and 'Gözlerninin Hapsindeyim' by Kayahan (1990), they sent the trio of Reyhan Karaca, Izel Çeliköz and Can Ugurluer (try saying that three times without stuttering!) with a twist-type track called 'Iki dakika' ('Two minutes'). The Belgian record company Madierpo released this single with the English version on the A-side. Another mistake: the Turkish version may be unintelligable for foreign listeners, but the English one is too, for totally different reasons, of which pronunciation is one. The group finished 12th in the Contest, which at that time was a reasonably respectable placing for Turkey.